This is an exciting the time of year in the automotive industry; the new lineup of models begins to arrive at automobile dealerships and 2017 will be a spectacular year for General Motors. The end of September is a very special time as it will mark the arrival of the New Chevrolet Cruze Hatchback at Surgenor Automotive Group. The all-new 2017 Chevrolet Cruze hatchback and the 2017 Chevrolet Cruze sedan have a 1.4 litre turbocharged 4-cylinder 153 horsepower engine. The turbo four-cylinder has a refined sound whilst accelerating, even under full throttle, and power builds smoothly. Both models offer a six speed manual or automatic transmission. The automatic transmission has an engine stop-start feature. This feature will save gas by automatically turning off the engine when you come to a stop and then restarting it as you lift your foot off the brake pedal. This feature operates smoothly and is one of the most unobtrusive stop-start systems tested by experts. The 2017 Chevrolet Cruze boasts phenomenal fuel consumption ratings. The combined fuel consumption rating for the Cruze hatchback is 7.3 litres per 100 kilometres for the automatic transmission and 7.4 litres per 100 kilometres for the manual transmission. The combined fuel consumption rating for the Cruze sedan is 7.0 litres per 100 kilometres for the automatic transmission and 7.3 litres per 100 kilometres for the manual transmission. Both models offer the ride of a larger automobile in a compact package. Four adults can ride quite comfortably with plenty of leg and elbow room. 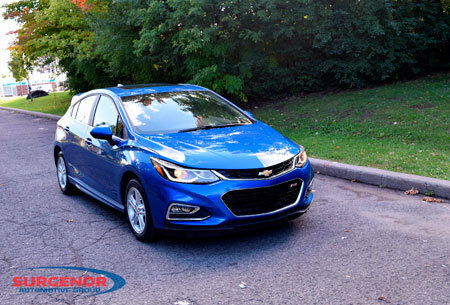 The 2017 Chevrolet Cruze hatchback and sedan has with well-shaped front seats, a roomy back seat, as well as a huge cargo area in the hatchback and trunk space in the sedan. With the back seats of the Cruze hatchback folded down, there is an additional 1.2 square metres of storage space. These features make the Cruze an ideal distance cruiser. The aerodynamic sculpted design gives the 2017 Chevrolet Cruze a distinct sportier look. The optional projector-beam headlamps and signature LED daytime running lamps will give the Cruze a mind-blowing appearance.